KINGSVILLE TOWNSHIP - In 1987, President Ronald Reagan proclaimed March as Developmental Disabilities Awareness Month. 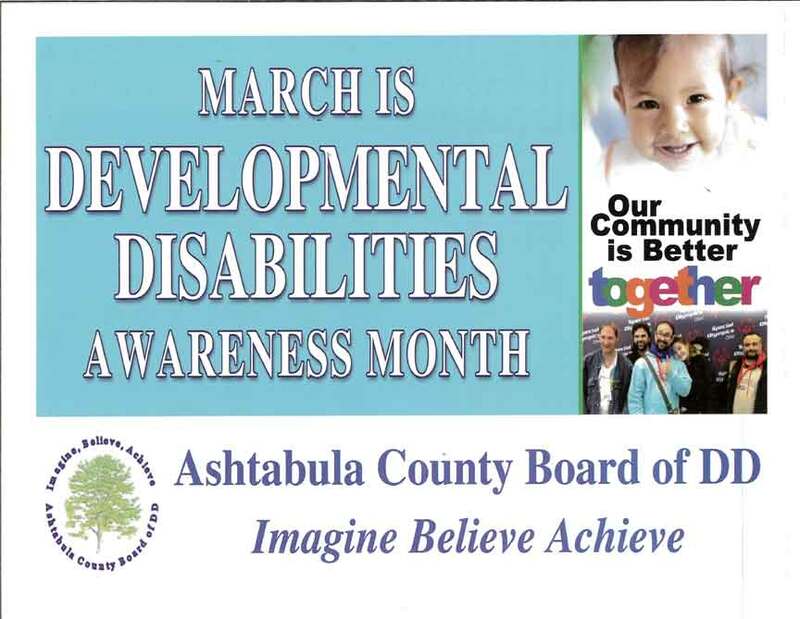 In honor of that destination, each March, the Ashtabula County Board of Developmental Disabilities seeks to increase public awareness of people with developmental disabilities. The Ashtabula County Board of DD plays a vital role in the lives of over 500 individuals with developmental disabilities and their families, Zeitler said. This role includes helping to make meaningful connections for both children and adults with developmental disabilities in the community. • In the beginning stages of life, Early Intervention connects babies and toddlers with the support they need to reach their full potential. • The Ashtabula County Board of DD coordinates essential services for all ages to achieve their dreams and goals. • Each individual is listened to as they imagine what is important to them in their life. Plans are developed and supports are established to help each person achieve their goals. • These areas may include employment and/or living independently in the community. Community members may learn more about the Board of DD and Ash/Craft Industries during an open house on 10 a.m. to 2 p.m. Thursday, March 14. The Ashtabula County Board of DD is located at 2505 S. Ridge Rd. East, Ashtabula. There will be light refreshments. Ash/Craft Industries is located at 5959 Green Rd., by the Ashtabula County Animal Protective League. Ash/Craft is also offering a free Shred Day up to 15 pounds ($.50 a pound after that). At the Ashtabula County Board of DD offices, guests will be able to visit the building and speak with people in the various departments of early intervention, investigative service, administration and more, Zeitler said. Zeitler said they work with the children in their natural environments, in their homes. “We do have play groups at our facility, and that’s open to all families in early intervention,” Zeitler said. Recently, the board signed a contract to have a daycare center come in this summer, Zeitler said. Special Olympics will also be represented during the open house. At Ash/Craft, Director Jill Oliver said tours will also be given. In January, Perrysburg-based Person Centered Services took over Ash/Craft, as all DD Boards across the state have been mandated to privatize adult services by 2024. A ribbon-cutting ceremony is planned at 12:30 p.m. with the Greater Ashtabula Chamber of Commerce. They are at the end of the second month of the transition, which has been very successful, Oliver said. “They’re excited about the new opportunities, the new programming opportunities we’re able to give them,” Oliver said. Oliver said the adults are able to go out in the community and visit the businesses more. They also have taken trips to a tea house and have been using the walking program at the Ashtabula Towne Square, among other trips. The waiver system allows this to happen, Zeitler said. The Ashtabula County Board of DD is mandated by the State of Ohio to provide the Medicaid match for all individuals with developmental disabilities receiving waiver services, which include both residential and vocational services. “Waiver services enable individuals to participate in their communities and obtain employment,” Zeitler said. Oliver said when people talk about the levy, the levy is financially supporting these services. “The county board has been instrumental in getting us where we’re at today,” Oliver said. Assistant Director Jan Church said they work hand and hand with the county board with the new opportunities they’re providing, but also continuing what has been there before. During the open house, guests can learn more about Ash/Craft and what it offers. “We’ll give tours. They’ll be able to see some of our program areas,” Oliver said. Approximately 300 individuals received adult services at Ash/Craft Industries and other private providers in 2018. Ash/Craft works with about 12 different businesses, with 46 different jobs in house, Oliver said. “They’ll be able to see our individuals working,” Oliver said. These activities include sewing, crocheting, painting and more, Oliver said. The workers complete packaging jobs for Fastenal and put together welcome kits for Ashtabula County Medical Center, do a lot of work for Allpass and work on light assembly and light packaging jobs. A kitchen and laundry room is under construction now but should be finished by March 14. They also are now planting for the greenhouse. It’s teaching them how to be independent, Oliver said. “Ash/Craft is a variety of work-focused and community integration and skill building,” Oliver said. The purpose of the open house is for people to come in and see what’s happening, Zeitler said.